Forecast: The wild weather finally comes to an end! The storm left its mark across the islands with damaging winds that toppled trees and brought down power lines. Destructive waves have been running up on roads across north shores. Incredible wind gusts peaked over the weekend with many spots reaching 50 mph down wind of the mountains. And an incredible recording on Mauna Kea where wind gusts clocked in at 191 mph on Sunday! It’s all due the position of a potent low that had developed to our north but now it is pulling away from the islands and the NW winds will begin to shift out of the north tomorrow and then back to typical trade wind direction on Wednesday. 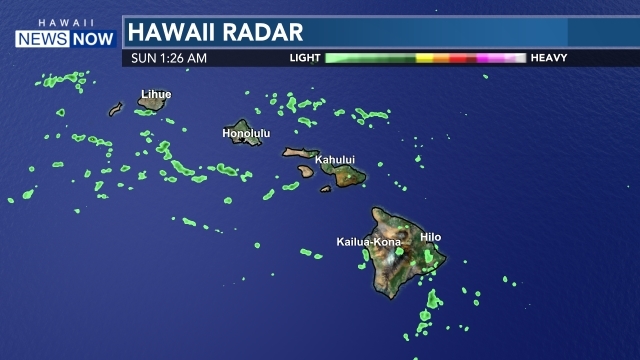 Expect passing windward and mauka showers to travel over the winds during the overnight hours into the morning hours. At times, we will see these passing windward and mauka showers make its way to leeward neighborhoods. Overall, temperatures are warming up but they will still feel cool in the mornings. Afternoon temperatures will feel more comfortable and typical for this time of year. The NWS has a number of ocean alerts up. A prolonged period of northeast swell is expected starting Tuesday night and will likely reach warning levels on Wednesday and possibly into Thursday along east facing shores. Surf will likely stay elevated in the advisory levels along east facing shores through early next week. A moderate long-period northwest swell is possible this weekend.